Preheat oven to 400°F. Pour the pizza sauce in a saucepan and simmer over low heat until it’s reduced to one cup, about 20 minutes. While the sauce reduces, cut the chicken breasts in half horizontally to make two same size pieces. Place the chicken in a heavy plastic bag and use a meat mallet (or pan) to pound the chicken until it’s as thin as you can get it without it breaking apart. Mix the Greek oregano and garlic powder in a small bowl and sprinkle both sides of each chicken piece with mixture. Heat the olive oil over medium-high heat in a large non-stick frying pan. Add the chicken pieces and cook 1-2 minutes on each side, just long enough to brown the chicken but not long enough to cook it through. You may have to do 2 batches to get this part done. Place the browned chicken in a single layer in a casserole dish. Spread the sauce over the top of each chicken breast. Layer each piece with sliced Mozzarella and pepperoni slices. Bake uncovered about 25-30 minutes, or until the cheese is melted and starting to brown and the pepperoni is slightly crisped. Serve immediately. 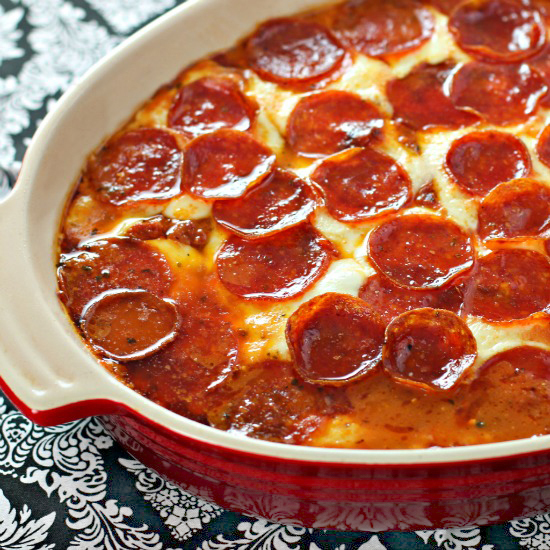 When you are craving low-carb, gluten-free and #Keto friendly Comfort food, you MUST try this simple and YUMMY Pepperoni Pizza Chicken Bake. This layered baked #casserole combines flattened #chicken breasts with a rich #lowcarb #pizza sauce topping. 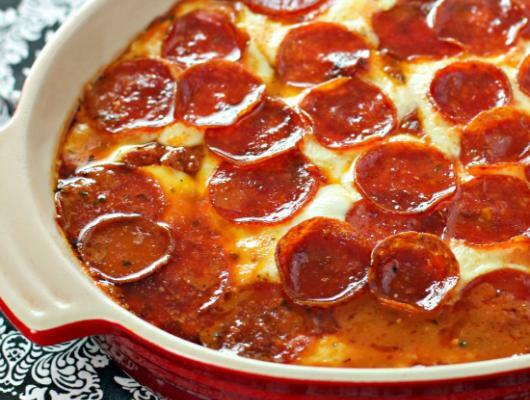 Top it all off with creamy mozzarella cheese and zesty #pepperoni rounds. Few ingredients and TONS of flavor!